Researchers: Stephen B. DeLong, Daniel J. Ponti, James J. Lienkaemper, Carol S. Prentice, David P. Schwartz, Carla Rosa, and Alexandra Pickering, U.S. Geological Survey, Menlo Park; Andrea Donnellan and Jay W. Parker, Jet Propulsion Laboratory; Ron S. Rubin, Timothy E. Dawson, and Gordon Seitz, California Geological Survey; and Kenneth W. Hudnut, U.S. Geological Survey, Pasadena. The Mw 6.0 South Napa earthquake created measurable surface rupture over about 12 kilometers on several active strands of the West Napa fault zone (WNFZ). 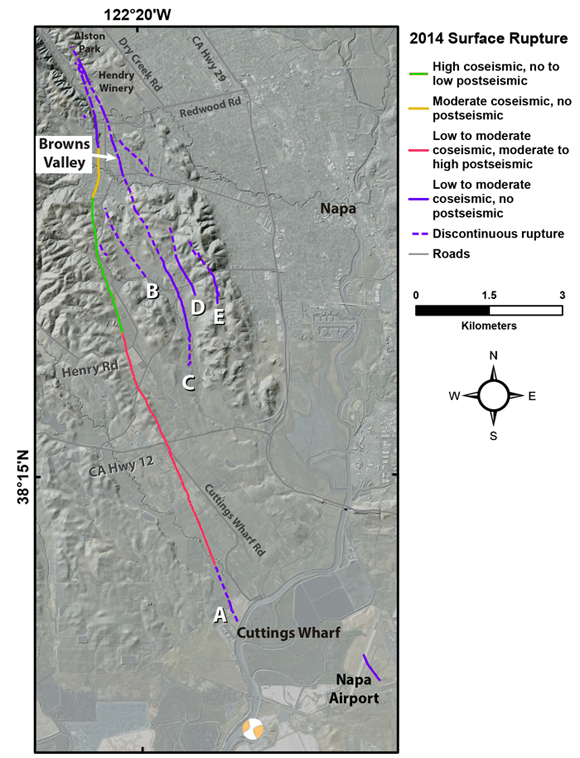 Field observations and airborne and satellite-based imagery show earthquake deformation and post-earthquake deformation along the main fault trace to the north of the epicenter. The complex fault rupture and post-earthquake fault slip has implications for estimating earthquake hazards on the WNFZ and for other fault zones. The WNFZ is part of the broad and complex San Andreas Fault System in the greater San Francisco Bay area of California. The WNFZ was mapped as a 46-kilometer long segment of subparallel fault traces from Vallejo to Saint Helena, California. It may extend further north or south and may connect with other fault zones. 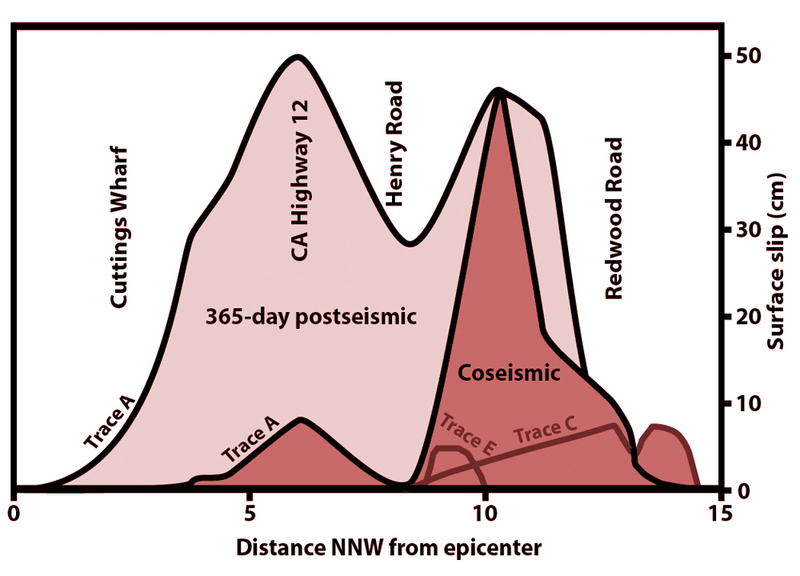 The 24 August 2014 Mw 6.0 South Napa earthquake occurred on the WNFZ at a depth of 8.8. kilometers. The event caused damage to roads, unreinforced buildings and produced measurable surface rupture. Here, field observations and uninhabited aerial vehicle synthetic aperture radar (UAVSAR) imagery are used to decipher the fault zone motion and characteristics during and after the earthquake. These observations are compared to other data and results published in peer-reviewed literature. Surface deformation extended at least about 12 kilometers to the north of the epicenter. Some of the mapped deformation was on mapped faults and some was on faults that had not been previously identified. On the northernmost part of the main fault trace, the surface rupture cut about 7 kilometers of the main fault and then branched off onto at least four subparallel minor fault traces. On the southernmost part of the main fault, most of the slip occurred after the earthquake and this postseismic movement added up to about 0.5 meter of motion over about one year after the event. The airborne UAVSAR data illuminated patterns of slight surface deformation that were not clearly visible in the field, likely because they were not expressed as distinct ground cracking. This led to a better understanding of how the complex ruptures were connected and that fault slip extended another 10 kilometers to the south of the clearly visible surface rupture. These observations help to map out the structure and characteristics of the fault zone. The complexity of the fault rupture and the significant postseismic deformation must be considered in any efforts to estimate earthquake hazards. DeLong, S. B., et al. (2016), Tearing the terroir: Details and implications of surface rupture and deformation from the 24 August 2014 M6.0 South Napa earthquake, California, Earth and Space Science, 3, doi:10.1002/2016EA000176.